Two scheduled production cuts and weak guidance for 2016 aircraft deliveries spooked investors. 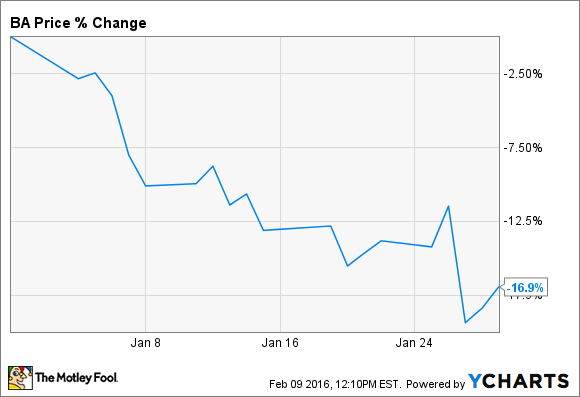 What: The stock market got off to a rough start in 2016, and Boeing (NYSE:BA) was no exception. Shares of the aerospace giant fell 17% during January, according to S&P Capital IQ data. Boeing January stock performance; data by YCharts. So what: Investors have become increasingly worried about global aircraft demand in the past year. While the low fuel price environment has been a boon for airlines' profitability, it has also reduced their need to upgrade to the most modern, fuel-efficient aircraft. Furthermore, the strong dollar makes airplanes (which are priced in dollars) more expensive for foreign airlines. Boeing is cutting 777 production until the next-gen 777X is ready. Photo: Boeing. Bears got some confirmation of their concerns last month, as Boeing announced production cuts for its 747 and 777 widebody aircraft families. 747 production will decline from one per month to 0.5 per month later this year, while 777 production will be reduced from 8.3 per month to seven per month in 2017. Boeing also projected that it will deliver fewer aircraft in 2016 than it did in 2015, leading to lower revenue and lower earnings. This decrease is mainly related to the timing of planned production increases and Boeing's plan to build some planes this year that won't be delivered until 2017. On the flip side, Boeing CEO Dennis Muilenberg actually announced another production increase for the popular 737 jet during January. Boeing had already announced increases from the current 42 per month production rate to 52 per month by 2018 -- now it intends to boost 737 production again in 2019, reaching a rate of 57 per month. Now what: Investors probably overreacted to Boeing's recent production announcements. The company delivered 762 commercial airplanes last year, and despite some short-term hiccups, annual production will likely rise to nearly 1,000 airplanes over the next five years. Boeing is likely to see even stronger improvements in its profit margin and free cash flow over that time horizon. As a result, Boeing stock looks like a bargain at its current valuation of just 14 times projected 2016 earnings.